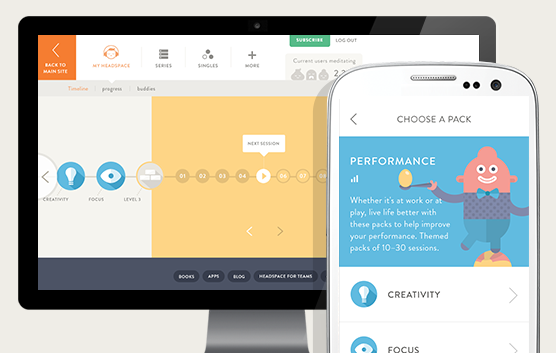 Headspace is a mobile- and web-based guided meditation app suitable for all ages. It is intended to help people deal with stress, to increase awareness, and to promote well-being. It relies on the principle that regular practice of guided meditation and mindfulness can help to improve various aspects of people’s daily lives, such as sleep, stress, and relationships. Headspace’s main feature is a daily 10-minute meditation. It begins with a 10-day foundation training, which is free of charge and includes short animated illustrations conveying the rationale in a clear and simple way. For additional options, users need to purchase access to the full version, which includes several themes (e.g., sport, health, relationships, performance). For each theme selected – compatible with the user’s preferences – Headspace provides several daily meditations and tunnels users through their progress. Additional features include single meditations and meditations for children by age group (under 5, 6–8, 9–12). Pleasant graphics and a welcoming atmosphere/ Relatable narrator/ Variable meditation options. Monthly fee may be considered high. Headspace is suitable for people who are new to mindfulness exercise or who want to engage in short daily mindfulness activities to help reduce stress levels. The children’s program has fewer options than the adult one, and parental guidance is advised, at least for the first few times of practice. Headspace is a well-structured program. Its graphics and illustrations are well-suited to the target goal and help to create a warm, welcoming environment for users. Throughout the program, users become acquainted with Andy who is Headspace’s founder, Andy Puddicombe. Andy’s character accompanies and guides the user, and narrates the meditations. Incorporating a character that walks users through the program creates a relatable experience and strengthens the user’s motivation to continue using the program. As described, Headspace provides a structured path that leads users step by step through the basics of mindfulness practice. It could be added as a supplement to treatment in cases where relaxation techniques and meditation practices would benefit the patient but are not covered in-person for various reasons (e.g., lack of time, lack of clinician training, or focus on other issues). The program’s price (at the time of evaluation) may be considered high for some patients, in which case we advise clinicians to suggest other meditation apps.